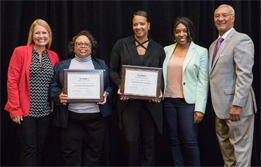 The National Association of Housing and Redevelopment (NAHRO) recently honored Lucas Metropolitan Housing Authority (LMHA) with two 2018 Awards of Merit. The winning projects were: Coffee Cafes “Coffee and Conversation” in the Resident and Client Services category and Well2Unity Bootcamp also in Resident and Client Services. Left to right: NAHRO Senior Vice President Sunny Shaw (Executive Director, Housing Alliance and Community Partnerships, Pocatello, ID), LMHA Vice President of Resident Services Coleena Ali, LMHA Board Vice Chair Alisha Gant, LMHA President and CEO Demetria Simpson, and NAHRO President Carl S. Richie, Jr. (NAHRO Fellow, Commissioner, Housing Authority of the City of Austin, TX). Coffee Cafes, located at the senior/disabled developments (Robert Dorrell Manor, Glendale Gardens, Vistula Manor, TenEyck Towers, Ashley Arms and Parqwood) allow residents to enjoy a cup of coffee and conversation. Topics including health and wellness, current events and resident concerns are discussed. Starbucks® provides a monthly donation of various coffees to the cafes. Well2Unity Bootcamp was sponsored by a grant from the Toledo Walleye Foundation. The Bootcamp was an 8-week fitness program focused on physcial fitness and nutrition. Fabulously Fit conducted fitness instruction, while nutrition classes were conducted by Ohio State University Extension Program. The NAHRO Awards of Merit program was created 19 years ago to recognize agencies who found innovative ways of making a difference in their communities and in the lives of the people they serve by creating affordable housing, revitalizing their neighborhoods and developing initiatives such as job readiness programs, public-private partnerships, disaster prevention projects and more. NAHRO, established in 1933, is a membership organization of nearly 20,000 housing and community development agencies and professionals throughout the United States whose mission is to create affordable housing and safe, viable communities that enhance the quality of life for all Americans, especially those of low and moderate income. NAHRO's membership administers more than 3 million housing units for 7.6 million people. Established in 1933, Lucas Metropolitan Housing Authority (LMHA) continues to provide affordable housing to adults, seniors and children in its Public Housing, Housing Choice Voucher, Mixed-Income and market rate housing units. LMHA also provides myriad programs and opportunities designed to improve the total quality of life for our residents, with the ultimate goal of achieving self-sufficiency. The programs and services are the result of successful collaborations with numerous community partners.